Paris, Galerie Karl Flinker, Hundertwasser: peintures récentes, March 1967, no. 604 (illustrated in colour). Berkeley, University Art Museum, Hundertwasser, October-November 1968, no. 63 (illustrated pp. 17 and 114). This exhibition later travelled to Santa Barbara, Santa Barbara Museum of Art, December 1968-January 1969; Houston, Museum of Fine Arts, January-March 1969; Chicago, the Arts Club, March-April 1969; New York, Galerie St. Etienne, May-June 1969; Washington D.C., Phillips Collection, July-August 1969. Munich, Haus der Kunst, Hundertwasser, 1975. This exhibition later travelled to Paris, Musée d'Art Moderne; Marseille, Musée Cantini; Luxembourg, Musée d'Etat; Madrid, Museo Español de Arte Contemporanea; Pfäffikon, Seedamm Kulturzentrum; Rome, Palazzo Barberini; Milan, Palazzo Reale. Cologne, Museum Ludwig, Hundertwasser, December 1980-February 1981 (illustrated in colour p. 243). This work is recorded in the Hundertwasser Archives under no. 604. The most dominant feature of this work is the huge staring eyes of the mask-like face, whose spiral pattern has a mesmerising effect. The prominence given to the head in this composition, reflects the influence of among others, Paul Klee, whose painting, Death and Fire of 1940 and other late drawings were known to have made an impression on Hundertwasser. Possibly the greatest influence, in the present work however, derives from the artist's interest in the primitive and ethnographic arts like the carved Maori head from a war canoe (see fig. 1). Drawing his swirling lines from plant and land forms found in topography, Hundertwasser developed a unique distinctive and mystic style that in this work is powerfully evoked to create an intense and almost hypnotic image. 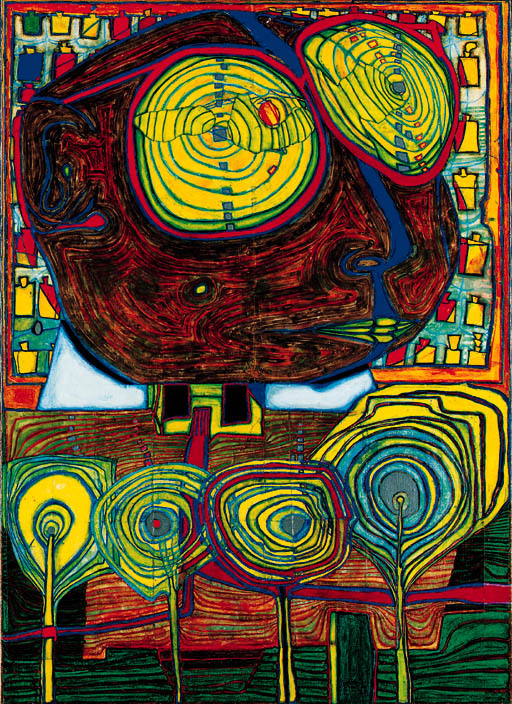 Above all, it is the glazed brightness of the driver's eyes that Hundertwasser has sought to capture and assimilate in this work. As Herschel B. Chipp commented: "He transferred the kind of archaic stare ....into his own imagery. It was the iconic or idolistic quality of the 'stare' that he attempted to capture in his work rather than any specific appearance or representation" (Exh. cat. University Art Museum, Berkeley, California, Hundertwasser, October-November 1968, p. 40).